I love the texture and it is true to color. Relax and sleep in the modern comfort of the Madison Park Coreen 3 Piece Cotton Blend Jersey Knit Pleated Comforter Set. 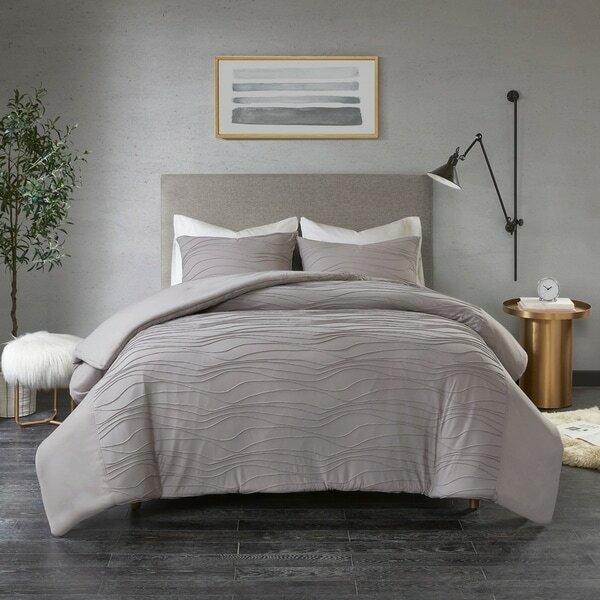 The grey comforter and matching shams are made from a rich cotton blend jersey knit fabric, for an incredibly soft hand feel. Textured pleating in a wave pattern adds dimension to the solid side borders and creates a sophisticated look. The hypoallergenic polyester filling in the comforter provides exceptional warmth and comfort. Machine washable for easy care, this cotton jersey knit comforter set gives your bedroom a comfy contemporary allure. Comforter And Shams:60-percent Cotton , 40-percent Poly Jersey Face, 100-percent Poly Jersey Back.